Midwestern Gothic – A Literary Journal » Blog Archive » Winter 2018 issue is on sale now! Winter 2018 issue is on sale now! 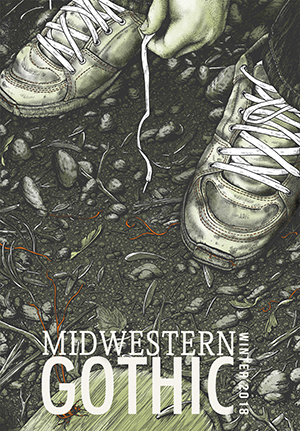 The Winter 2018 issue of Midwestern Gothic is here, featuring new fiction, poetry, nonfiction, and photography about or inspired by the Midwest! Start your 2018 reading goal right, and settle in with some of the regions’s finest voices. With cover art by the incredible Erica Williams, we’re thrilled with how this issue turned out! Check out the Winter 2018 issue for fiction from Renée Bailey, Rebecca Berg, Kathryn Drew, Carol Dunbar, Hazel Foster, Mattie Ganson, Bruce Johnson, Halee Kirkwood, Chad Koch, Tyler Meese, Carly Anna Miller, Mario Perez, David Shieh, Ian Stoner, & Matt Whelihan. Plus poetry from Melissa Boston, Collin Callahan, Cortney Lamar Charleston, Greg Emilio, Lisa Favicchia, Ceridwen Hall, Justin Hamm, Gwen Hart, Elizabeth Kerper, Jacob Lindberg, Alysse McCanna, John McCarthy, Ken Meisel, Max Schleicher, M. Drew Williams, & Guinotte Wise. And nonfiction from Tamara Dean, Melissa Grunow, Bronson Lemer, Nora Seilheimer, Brooke White, & Jason Zeitler. You’ll also find photography by Dallas Crow, Dawn Eves, Gail Jeidy, & David McCleery. Shop now for the Winter 2018 issue of Midwestern Gothic. Winter 2017 issue is on sale now! Issue 22 is On Sale Now!